This season has been great in terms of goals for Cristiano Ronaldo. But Ronaldo has also shown a big variety of ways to celebrate his goals. Here you can watch his best moments of joy this season. 1. "The Silencer" - Cristiano Ronaldo requests silence from Atletico Madrid fans, in Vicente Calderon, after scoring the winning goal from Real Madrid in the second leg of the quarterfinals of the Copa del Rey. 2. "The Thumb Sucker" - Cristiano Ronaldo takes his thumb to his mouth, after scoring a goal. This came as a dedication to his six months old son, also called Cristiano Ronaldo "Junior". 3. "The Claw" - My personal favorite and one of the most repeated celebrations this season. This gesture is meant to simulate his son attempts of trying to climb the cradle, to get out. 4. "The Dancer" - This one is one of the funniest for sure. Ronaldo and Marcelo celebrate together dancing in a funny style. 5. "The Fist Anger" - A celebration who demonstrates Cristiano Ronaldo anger and power. This photo was taken in the game against Racing Santander, in Santiago Bernabéu. 6. 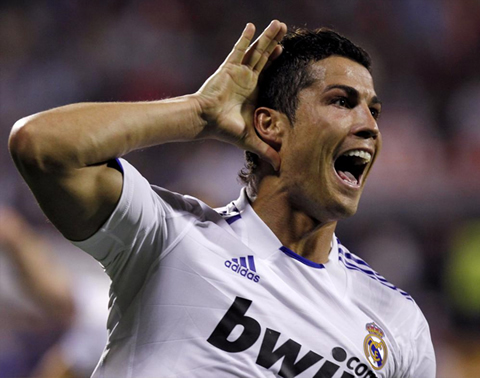 "The Deaf" - Cristiano Ronaldo gets insulted in most stadiums throughout Spain. This is his response: He scores goals after goals. Then he enjoys the silence when he celebrates his goals. Photo taken in the match against Hércules, in Alicante. 7. "The Sliding Machine" - Cristiano Ronaldo slides like if he was having fun in some "Aqua Splash". Picture taken in Bernabéu, in the match against Racing Santander. 8. "From Ronaldo to Ronaldo" - Cristiano Ronaldo celebrates another goal and this time he remembers a gesture that the previous brazilian Ronaldo Nazario used to have after scoring goals, when playing for Real Madrid as well. 9. "The Kinder Garden" - Cristiano Ronaldo grabs the hand of Angel Di Maria and goes for a run, after blasting another goal, this time in the biggest stage of all, the UEFA Champions League, against Ajax. 10. "The Claw Mirror" - Cristiano Ronaldo repeats the claw gesture, but this time he does it in front of Marcelo, who also does the same. This picture was taken during the game against Getafe.